Now is the time to sacrifice a few sacred cows in service of the greater good. With the recent announcement of the Rear Admiral Michael Noonan as the incoming Chief of Navy, we can now look more earnestly towards the announcement of the successful bidder for SEA 5000, the Future Frigate, which must surely be just around the corner. From an operator’s perspective, the wait has been an anxious one with the (unfortunately inevitable it seems) ominous specter of doom hanging over the selection. Looking at the proposal on paper, you may ask why so much chagrin over what seems to be a program delivering world-class naval platforms and sensors for the Royal Australian Navy, regardless of which ship we end up with. Well yes, there is an element of truth in that assumption. However, the anxiety exists in the ever-present possibility that we will end up with a capability that well, isn’t. We already know that regardless of the outcome, the defense ministry and the government will look to incorporate the leading edge phased-array radar technology provided by Australian company CEA Technologies, with elements of the United States’ Aegis combat system, ensuring a commonality with that of the Hobart-class destroyers. Fine, no real dramas there. When we look however at the three final contenders in light of the wider capability requirements outlined for SEA 5000, there is a very real possibility that the right warfighting capability selection will yet again be hijacked by a choice which presents greater political gain than advantage over a future enemy. Given the current tenuous state of the government’s position and the undoubted need to force an upward trend in the polling figures, this outcome is painfully likely unless some real courage and foresight is shown in the final decision. Navantia’s F-5000 presents the most readily accessible option to those without more than a cursory knowledge of global naval platforms. After all, they have likely been bombarded with images of it in its SEA 4000 guise where, in its air warfare specific incarnation, it has entered service in HMA Ships Hobart, Brisbane and later, Sydney. The F-5000’s proponents will laud its selection as providing efficiencies and financial savings as well as benefits to the existing workforce given its commonality with a platform already being built here in Australia. The problem, however, is that the warfighting capability directed for SEA 5000 will be nowhere in sight if the Navantia option is selected. The Future Frigate capability called first and foremost for an anti-submarine warfare (ASW) frigate. The F-5000 is not that. In fact, apart from the add-on sonar systems, the F-5000 is largely everything that you don’t want in conducting ASW. Basically, the hull and its internal systems are far too noisy to satisfy the requirements of a true ASW ship. Fortunately, in the other two contenders, we have ships that have been designed with ASW at the forefront and in the case of the BAE Systems’ Type 26 frigate, the capability demands put down by the UK government for that platform were strikingly similar to those of SEA 5000. Fincantieri’s FREMM is a proven platform having served now for many years with both the French and Italian navies. It would certainly do the job, and the maturity of the design will surely give decision-makers some comfort that there would be minimal “surprises” in the build phase. Those that like the security of an even-money bet will likely plant their money here. If we are to gain most value for money however, in a project whose effects are planned to span more than 40 years from construction to disposal, the Type 26 is the wisest and most common-sense decision. Whilst embryonic in terms of shipbuilding (if selected, the Royal Australian Navy build timeline will commence before that of the UK, the Type 26’s existing customer), to deride the platform on these lines is to sell the project short. BAE is no slouch in ship design, and they have taken many steps to ensure a robustness and surety in the design of the platform and its systems before build, most notably by conducting trials of its technologies on existing platforms and large-scale test beds. Sufficient confidence can be had in this approach to dismiss the “immature design” argument. The Type 26 then, provides the Navy with not only the most effective ASW hull (specifically designed for the role, considering noise signatures and sensor and weapon use) but also the clearest winner in regard to “future-proofing.” Provided with greater margins for future growth in the systems and sensors onboard, the Type 26 will support the ADF’s need to remain at the forefront of technological advantage given our paucity of platforms from a purely numbers perspective. This in itself will bolster its efficiency and overall value-for-money credentials above its fellow competitors. With the final three contenders selected from a robust down-select process in the first place, they are all suitable platforms over numerous selection criteria. 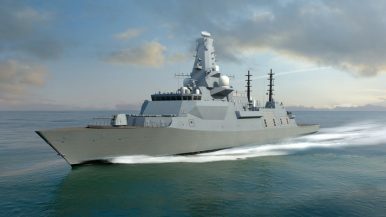 In this selection however, the opportunity exists for the government to demonstrate greater vision and understanding of its military capability needs through the selection of the Type 26. Of course, there are a multitude of contributing factors that demand consideration by our political leaders. But if we are to be serious about our naval influence and contribution to the region in the coming decades, now is the time to sacrifice a few sacred cows in service of the greater good. Duncan MacRae is a current serving member of the Royal Australian Navy (RAN) with almost 20 years experience as a warfare officer. The opinions in this article are the author’s alone and do not represent the position of the Australian Government, the Australian Defence Force, or the Royal Australian Navy. What impact will Australia’s choice of the Type 26 have on the U.K. and the Pacific?